HIS TIME HAS COME - NOT GONE! Week one of the residency. My red Renault is hidden behind the green bush in the middle of the above location shot. I’m working in an office on the ground floor at the right hand side of the building, but I’ve got access to the Nineteenth Century riches of the whole place, a bounty that feeds my postmodern tastes, big-time. In the end, this website will take a chronological approach to Patrick Allan-Fraser’s life. But, for the moment, I’ll just be grabbing what I can. And what I have easy access to is the self-portraits of artists that used to belong to the Clique (they’re hanging in the gallery which is the grand space to the left of the central tower in the above photo) and the correspondence from those artists (each individual letter wrapped in white tissue). Together, I’m hoping they will throw light on the commissioning process and more. I mean I’m hoping that by the time I’m finished this page, these paintings will be dripping with meaning, flaming with significance. 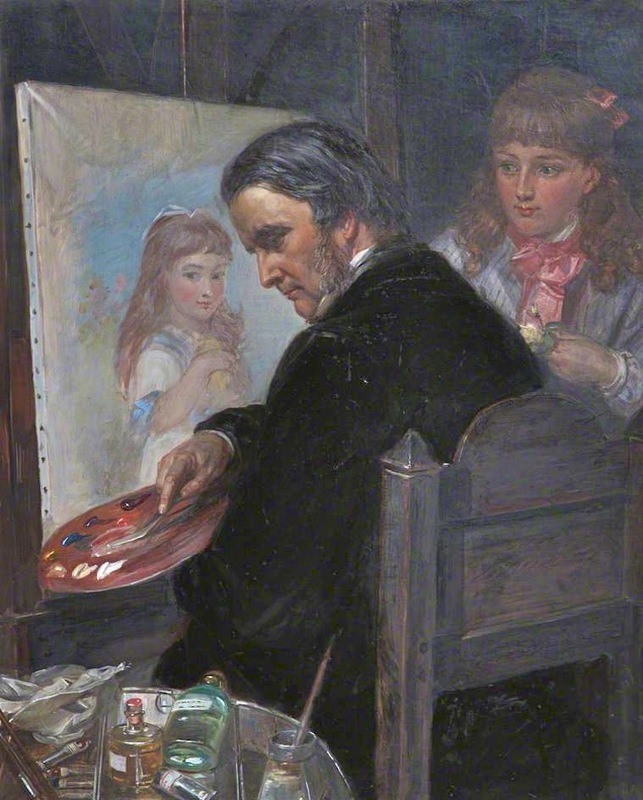 The series starts with a self-portrait by Patrick Allan-Fraser which was painted in 1849 and hung in the Dining Room (the Gallery being built at the time). At least that’s what The Book of Hospitalfield states, a volume that in 1894, shortly after Patrick’s death, was commissioned by Hospitalfield Trustees. The book was edited by George Hay and published in an edition of just 14 copies, of which number 9 is in the library here. Which is where I read it, though I never can spend time there without regretting the loss of the First Folio that was sold in the Twentieth Century. I wonder how much cash they got for a copy of the best book ever. Whatever it was, it wasn’t enough. I thought about extracting the left panel of PAF’s triptych, to focus on that as a self-portrait with palette, brush and some kind of frame (I don’t mean the glorious carved wooden frame that surrounds the whole). But it’s obvious that the context in which Patrick chose to present himself is with his wife and his mother-in-law. The scheme - Elizabeth senior in the middle - must have been so conceived from the beginning, given the way each figure is looking: Patrick and Elizabeth towards each other, the parent - one rich old lady - gazing straight ahead. At the time of painting, she had just two years to live. After that, her English property was inherited by Patrick and Elizabeth. I’m not sure what Patrick called the picture. ‘Two’s a marriage settlement, three’s an investment’? Possibly not, as Patrick and Elizabeth’s marriage seems to have been a genuine match. I wonder if I’ll get away with the beginning of that. I suspect such a modern perspective may jar, but let it stand for the moment. Meantime, Frith will emerge more clearly as the years roll on. 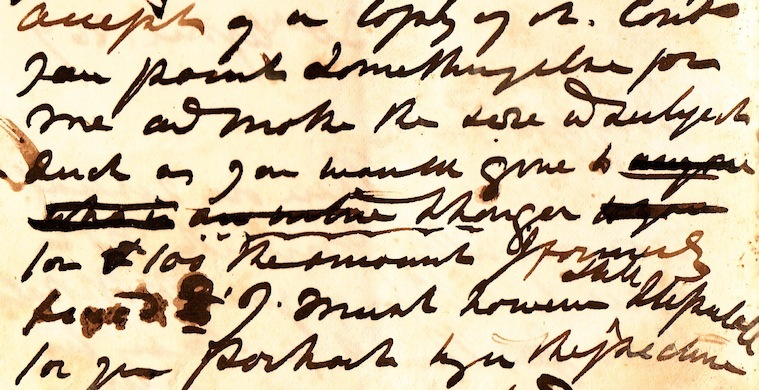 Letter from Thomas Brookes to Patrick Allan Fraser, 1855. Courtesy of the Hospitalfield Archive. What did Patrick think of the picture? I don’t know. But he paid £100 for it, which is £10,000 in today’s prices - so he must have been content. Actually, I think he would have liked the theme of a mature man facilitating/overseeing/tolerating creativity in the next generation. 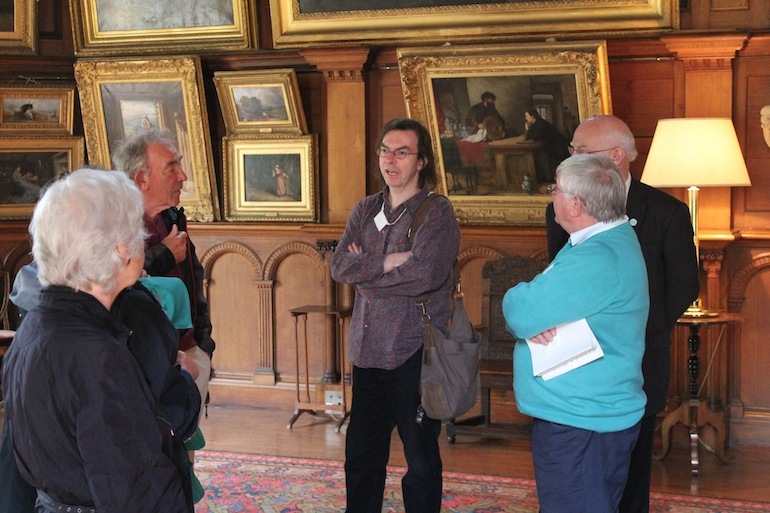 In just the same way, Patrick Allan Fraser might be peeping down from above at the six young(ish) artists in residence at Hospitalfield in June of 2013. 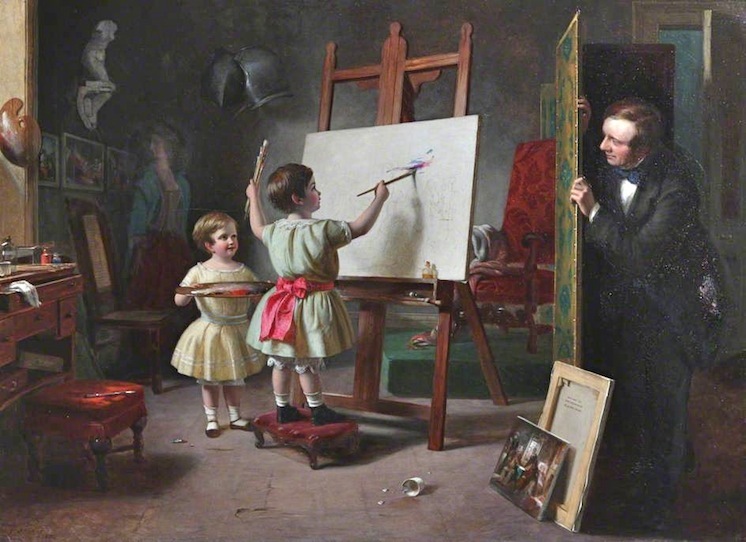 Mischief in the Studio, Thomas Brooks, 1855. Hospitalfield. 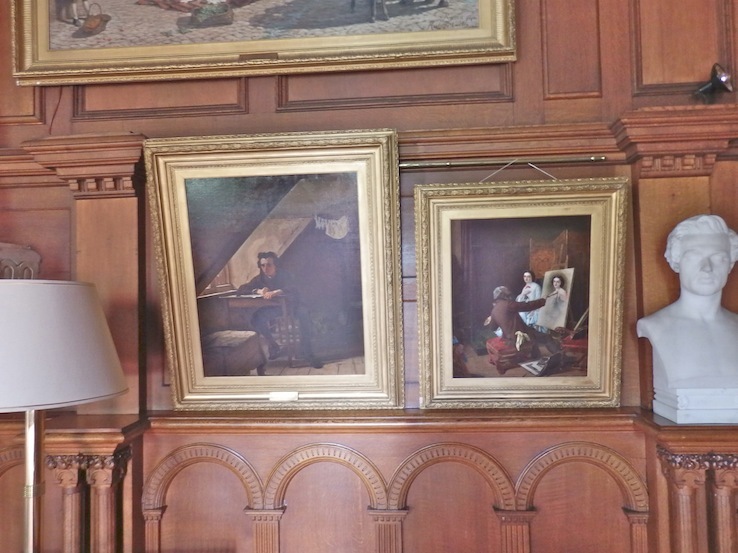 What’s not immediately obvious and is only slightly clearer on the original picture which is hung in rather a dark corner of the Gallery at Hospitalfield, is that there is another person in the room, top left of the painting. She is wearing a turquoise shawl and a red skirt. A professional model, hired by the hour? The children’s mother? If so she’s been given a distinctly marginal role. 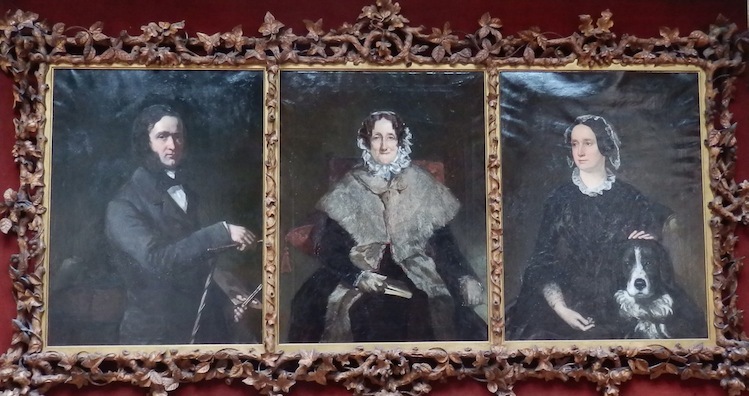 In any case, the self-portrait would seem to be a family portrait, as is Patrick Allan-Fraser’s own. Augustus Egg was the next to make a picture for Patrick, but not until two years later. Egg was closely connected with Charles Dickens through the Guild of Literature and Art, a philanthropic organisation they set up to provide welfare payments to struggling artists and writers. Patrick Allan Fraser expressed interest in this and was considering donating Hawkesbury Hall to the Guild, a property he and Elizabeth had inherited when Elizabeth senior died in 1851. Charles Dickens wrote four letters to PAF on the subject, which I’m delighted to say are still here at Hospitalfield, but I’ll save that treasure for another page. Augustus Egg acted the lead in Not So Bad As We Seem, a play written by Edward Bulwer-Lytton to raise funds for the Guild, and Egg’s own role in this was to be the inspiration for the self-portrait he came up with. 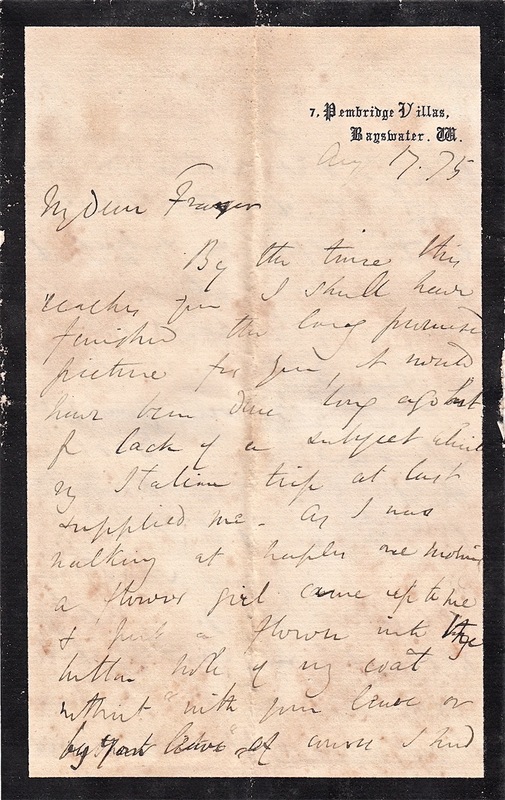 Letter from Augustus Egg to Patrick Allan Fraser, 1858. Courtesy of the Hospitalfield Archive. ‘...was required, however I have one now and I expect it will be done very shortly, and what is more I think you will like the subject. I will tell you what it is. Since we met in London, and seeing how truly in earnest you were about everything connected with our Guild, I thought I could not do better than paint myself as the poor author in our play, now as I understand you that the pictures were to be mixed up in the affair that that was just the subject suited for the purpose and one that I felt certain you would like. Now tell me whether you do like. You will be glad to hear also that both Frith and Phillip are on the point of commencing theirs so I think you stand a very fair chance of getting them all before the end of the year. With best regards to Mrs Fraser. Believe me, my dear Allan, very sincerely yours, Augustus Egg. Now, as the purpose of donating Hawkesbury Hall to Dickens’s Guild was to help poor authors and artists, I see why Egg, who was dedicated to the Guild’s purpose, would think it appropriate to portray himself as a poor author. However, I’m not sure what Egg means when he says that he understands that the pictures were to be mixed up in the affair. Perhaps part of PAF’s brief was that the self-portraits had to have a social purpose. Certainly, that might explain why Thomas Brooks was neglecting his female sitter and instead encouraging his children to explore their creativity. OK, I’ll bear that in mind as I go forward. I have to say, so far it’s been a joy writing this page. Admittedly, peering at the photographed images of letters in an effort to decipher Victorian handwriting is hard on the eyes, but when I’ve had my fill of that I can skip up the red-carpeted staircase and along to the Gallery to rest my eyes on the paintings. The Augustus Egg is in a gold frame. There seems to be a bed in front of the ‘distressed poet’ and another behind him. These may not even be his own pants and socks hanging from a rafter in the garret. What can I say? 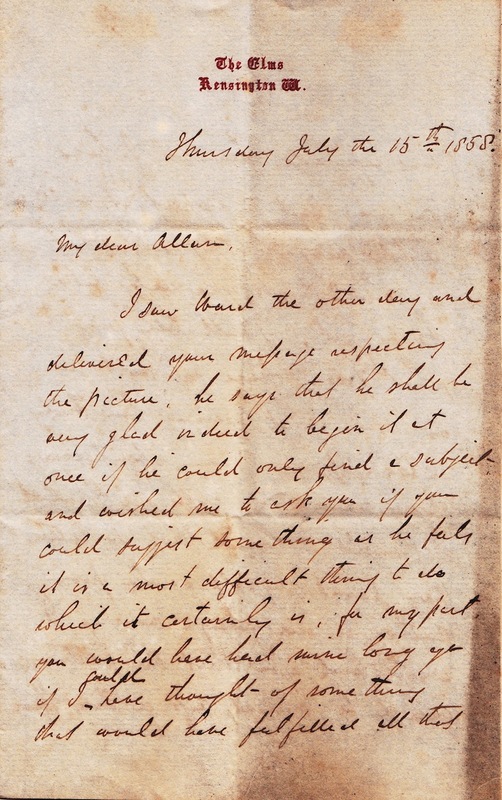 On August 23, 1858, Egg wrote that he’d sent off the picture, and that Frith and Phillip had started theirs. He also took the trouble to suggest that Henry O’Neill be included in the commission, having been a prominent member of the Clique. 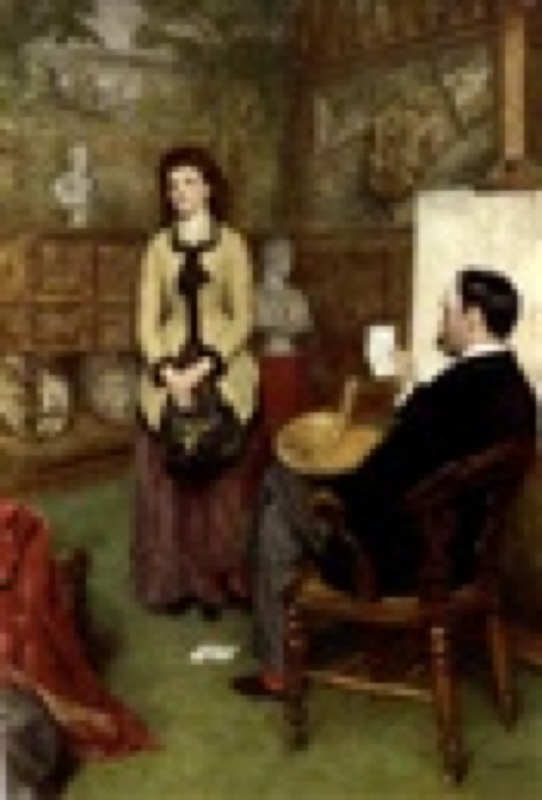 On September 10, Egg wrote that he was glad that Allan liked the painting and that he would forward a copy of the play upon which the portrait was based: Not So Bad as We Seem. In the letter, he mentions that he’s glad that O’Neill was to paint a picture, as the series would not be complete without him. 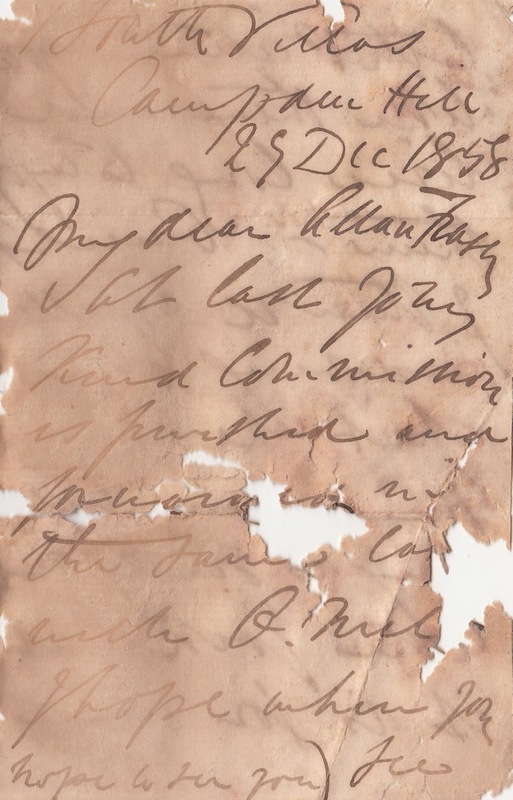 Letter from Henry O’Neil to Patrick Allan Fraser, 1858. Courtesy of the Hospitalfield Archive. I like the way that the members of the Clique refer to each other in their letters, and that it’s the same names that keep coming up, confirming the core members. Interesting to learn that Frith had started a sketch and that he’d made himself look more handsome than he was. Pity nothing seems to have come of this, perhaps because Frith was becoming so famous and sought after. Below is a reproduction of The Derby Day. The product of eighteen months of unremitting toil, according to the painter. 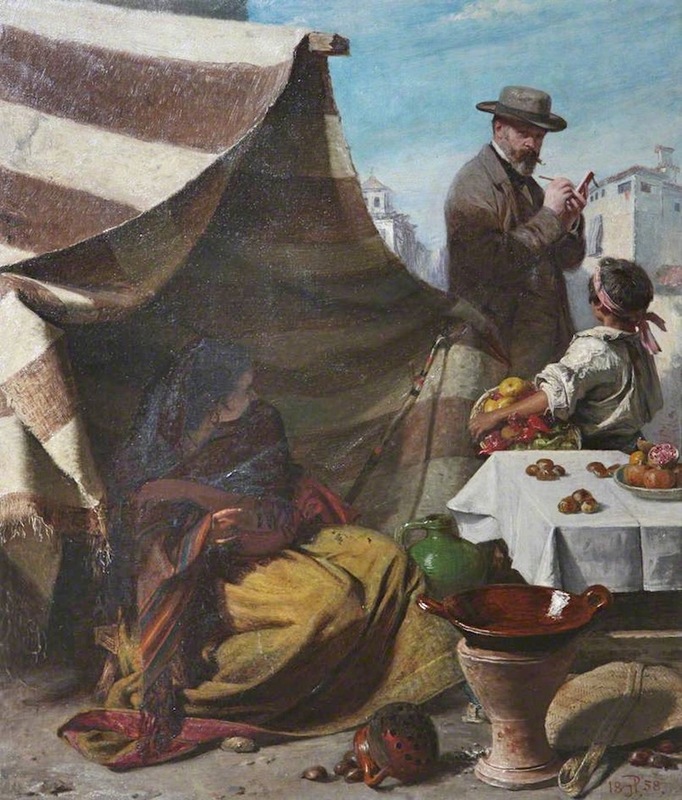 It caused a sensation when it was shown in the Royal Academy Summer Show of 1858. 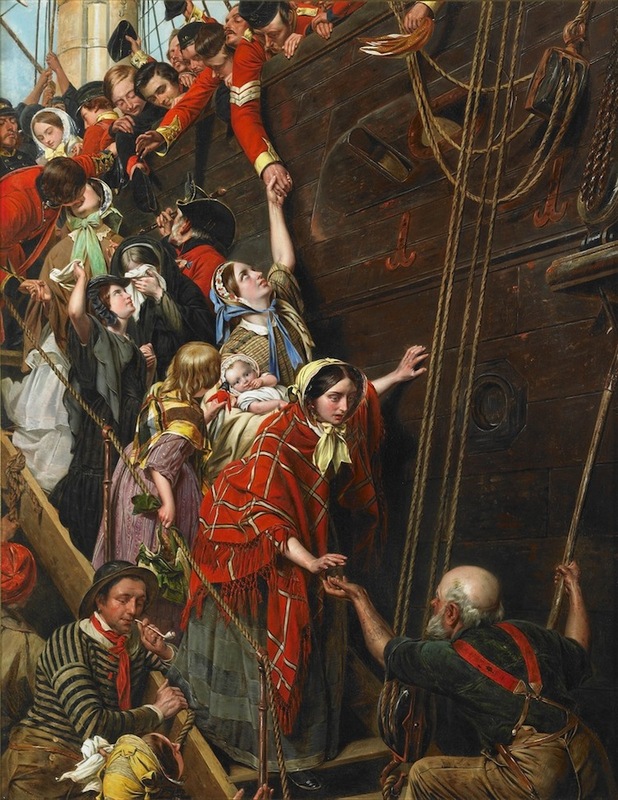 A railing had to be installed in the gallery to keep onlookers back, the first time that had happened since David Wilkie’s Chelsea Pensioners in 1822. So the scene in the gallery would have echoed the crowd scene depicted in the painting itself. WP Frith - socially engaged artist? The Derby Day, WP Frith, 1858. Tate Gallery. Eastward Ho! created almost as great a sensation at the 1858 Royal Academy Summer Show as The Derby Day. Subsequently, the painting toured Britain and was seen by half a million people. The vivid drama of soldiers boarding a ship at Gravesend - leaving Britain to fight in the Indian ‘Mutiny’, the first Indian war of Independence in 1857 - caught the imagination of the general public. Eastward Ho! Henry O’Neill, 1858. Museum of London. Ah, good, Patrick has obviously mentioned Richard Dadd, one-time leader of the Clique. The same year, 1942, that Patrick Allan came north and found a wife, Richard Dadd went travelling in the Middle East and lost his mind, possibly through sunstroke. On returning from his travels about a year later, he killed his father and was confined in an asylum. He did continue to paint, but I don’t think he would have been able to satisfy Patrick’s commission. Having said that, what is the gloriously mad picture below, which was worked on at Bethlem from 1855, but a blockbuster of a self-portrait? 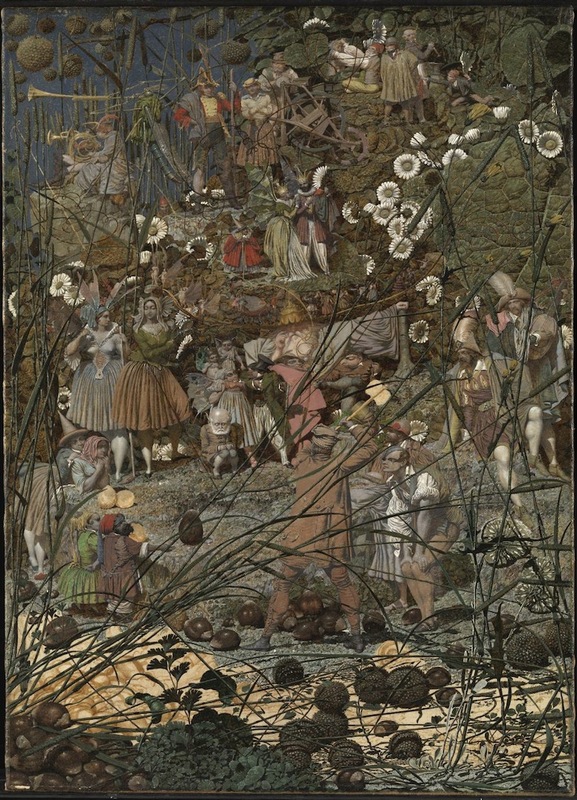 The Fairy Feller’s Master-Stroke, Richard Dadd,1855-1864. Tate Gallery. ‘I suppose you have not quite deserted your easel. Though I can fancy myself the idlest of living mortals if I could afford such a luxury. When you are in London again I hope to see you and revive our friendship of “auld lang syne”. Painting Con Amoure, Henry Eugene O’Neill, 1858. Hospitalfield. Isn’t it the same model who features prominently in Eastward Ho!? The woman returning down the gangway after saying farewell to her soldier husband? If so, O’Neil, having just painted a copy of his much-admired work, is celebrating his success d’éstime by painting the ‘pretty girl’ another couple of times. I can’t see much of a socialist theme to this work though. I don’t see how it would help the common man or woman get through his or her working day. Perhaps, in briefing O’Neil, Patrick had given up on his original idealism and was now settling for a self-portrait of any description. What is that rod doing, floating in the air, pointing towards the woman? I think another trip up the red carpet is called for, to see how the picture is hung in the gallery at Hospitalfield. I’m actually running up the stairs so keen am I to get on with this. And I see that the ‘rod’, O’Neil’s walking cane, is actually lying against the steps, throwing a dark shadow across them. 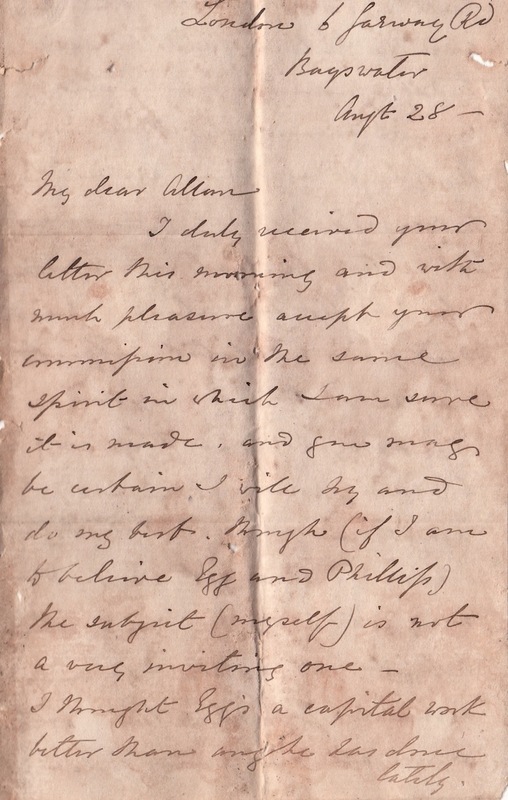 Letter from John Phillip to Patrick Allan Fraser, 1858. Courtesy of the Hospitalfield Archive. At last your kind commission is finished and [illegible] the same case with O’Neil’s. I hope when you see both pictures you will like them and live long to enjoy them. O’Neil’s I think is excellent and very like what he is now. My [missing word] you will say is surely not like Jock but it is for time and its [four illegible words] has made great havoc with your old friend. The subject is something I saw in the south. Please excuse this hurried note and with the sincere wishes that you and your good lady will enjoy a happy year. Yours from, John Phillip. John Phillip was from the Aberdeen area and would sometimes return to Scotland. I suspect that he and Patrick were on especially warm terms given the number of letters from him to PAF, and when Lucy Byatt, the director at Hospitalfield, was showing we current artists-in-residence around the place on our first day, she suggested that the portrait PAF painted of Spanish Phillip was one of his most accomplished. I agree, but I’ve also stumbled on a portrait by John Ballantyne of Spanish Philip in his very plush London studio. The woman sitting in the picture below is Maria Phillip, John’s wife, and the sister of his old friend of Clique years, the unfortunate Richard Dadd. 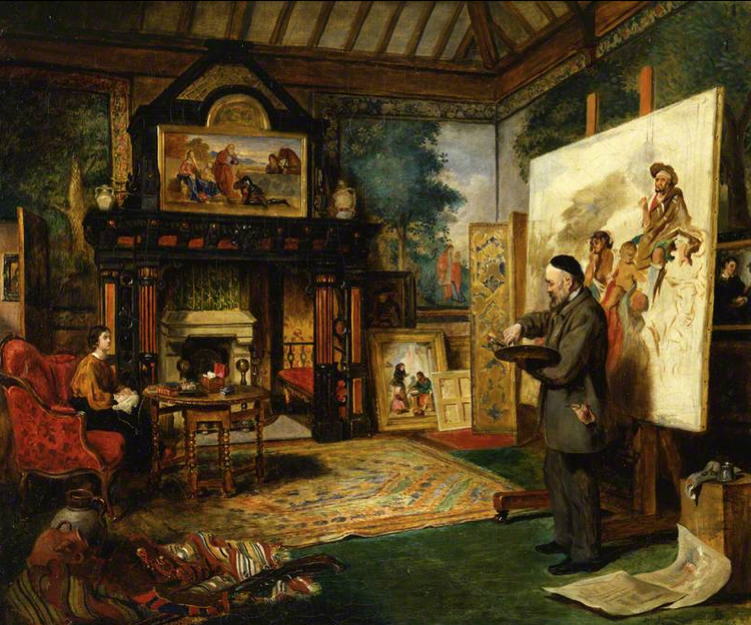 John Phillip in his Studio, John Ballantyne, 1859. Aberdeen Art Gallery. That’s an unsettling thing to read. Perhaps Maria’s ‘madness’ was partly a case of domestic abuse. And when one looks at Evil Eye again, one can read it differently. John Phillip has been drawing something when a flash of movement has put him off his sketch. Furious at the loss of his muse, he turns around and gives the evil eye to the woman who has knocked a bowl of fruit off her table. The Cedar Room, where Evil Eye hangs, was only added around the time of PAF’s death. And the inventory of paintings made at the time indicates that all the self-portraits by members of the Clique were hung in the main gallery, though the triptych featuring himself and the Elizabeths hung in the dining room. Nevertheless, it’s to the Cedar Room one has to go in order to look at Evil Eye today. I’ve just taken a photo of the painting and I can see myself in the reflection (the dark vertical up the middle of the picture) while I can no longer make out the Spanish woman cowering from John Philip’s gaze. Together, the assessing gazes of John Phillip and myself have made her disappear, which may have been what she was afraid of in the first place, but which I think is most unfortunate. If I go away again, having deflected John Phillip’s malevolent stare, hopefully she’ll come back to enjoy the sunlight falling onto the street in the town where she lived once and will always live as long as this painting survives. PAF: “What a great Christmas 1858 has been for the self-portrait project,” said Patrick, with a trace of sarcasm, to Elizabeth. Could the PAF picture below represent Patrick enjoying his new paintings in the Gallery, which is where it was hanging at his death? 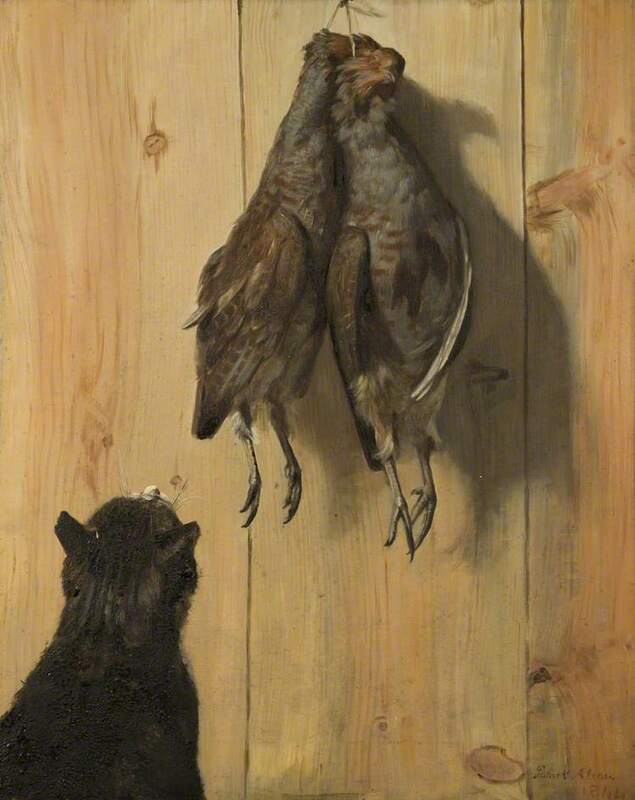 Cat and Partridges, Patrick Allan-Fraser, 1844. Hospitalfield. That for you. What for me? It’s quite a neat way of summing up the relationship between collector and artist. Or between writer and reader. Or between any two parties that are involved in a transaction. Despite what I take to be these good intentions, it was another twelve (yes, 12) years before the painting was in its buyer’s hands. So we’ll leave that self-portrait for now but please believe me when I say it’ll be worth waiting for. Augustus Egg died in 1863, five years after portraying himself as a distressed poet. It was also five years after painting Past and Present, a triptych about the fall of a woman through adultery, a morality tale that helped make Egg famous when the work was shown at the Royal Academy in 1859. As with Frith’s very successful Derby Day, the large paintings now belong to the Tate. Egg had a chronic respiratory disease and was advised that he’d be better off living in the hotter, drier climate of north Africa, where he died shortly after moving there. Portrait down, as it were. Dickens said of Egg: a "dear gentle little fellow, always sweet-tempered, humorous, conscientious, thoroughly good, and thoroughly beloved." 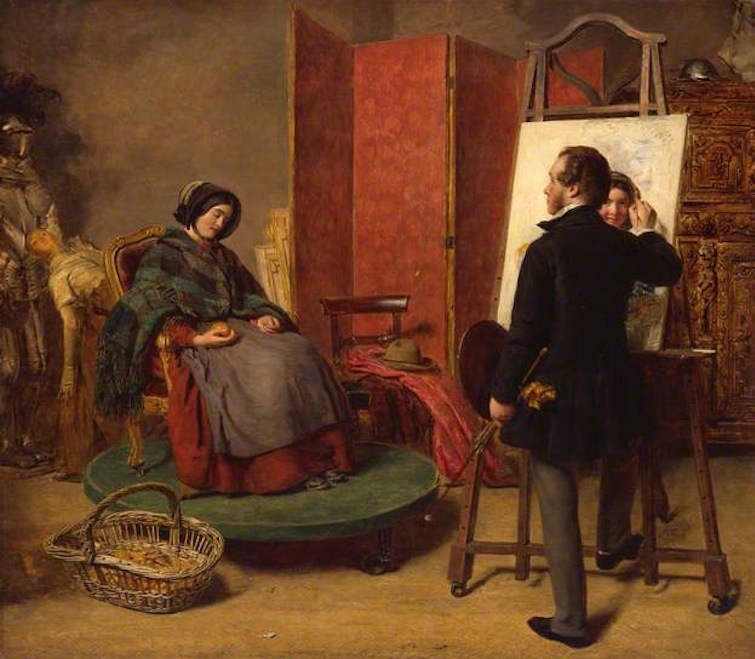 John Phillip died in February 1867, a few days after suffering a stroke while visiting the studio of William Powell Frith. So, in the 1860s, Patrick Allan Fraser was losing friends rather than gaining self-portraits. Does that make any sense? Let’s put the first sentence all together: ‘There are several reasons why I must not agree to either of your proposals but think we may by simply adhering to the conditions on which I gave and you accepted the commission and of the difficulty caused by your delay in painting the picture – you will no doubt remember I left the subject and size wholly to you and that the only condition I attached was that your own portrait should be introduced - now as I will not pay the price you now ask for the “new model” the picture you intended to give me nor accept of a copy of it. That’s it Patrick, stick to your reasonable grounds. Anyway, the gist is that Frith asked for more money and Patrick refused it. So what happened? Nothing. Until, eight years later, by which time EM Ward had come up with the goods, so we’ll put Frith aside again. His day will come though, and, ultimately, he will no more let you down than he let PAF down. 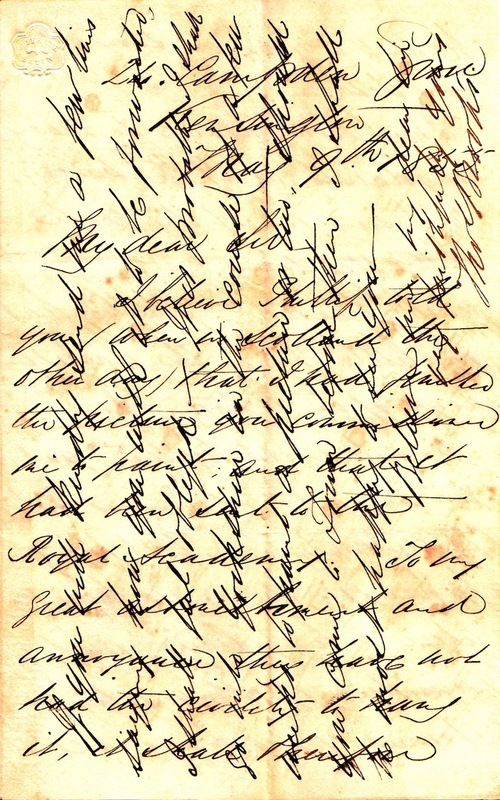 Letter from EM Ward to Patrick Allan Fraser, 1874. Courtesy of the Hospitalfield Archive. The letter goes on describing Beatrice as having ‘artistic proclivities being a very fair player on the violin (for her age) and passionately fond of pictures. I repeated your kind message to her and she bids me say how proud she is in being preserved in perpetuiti in your collection. 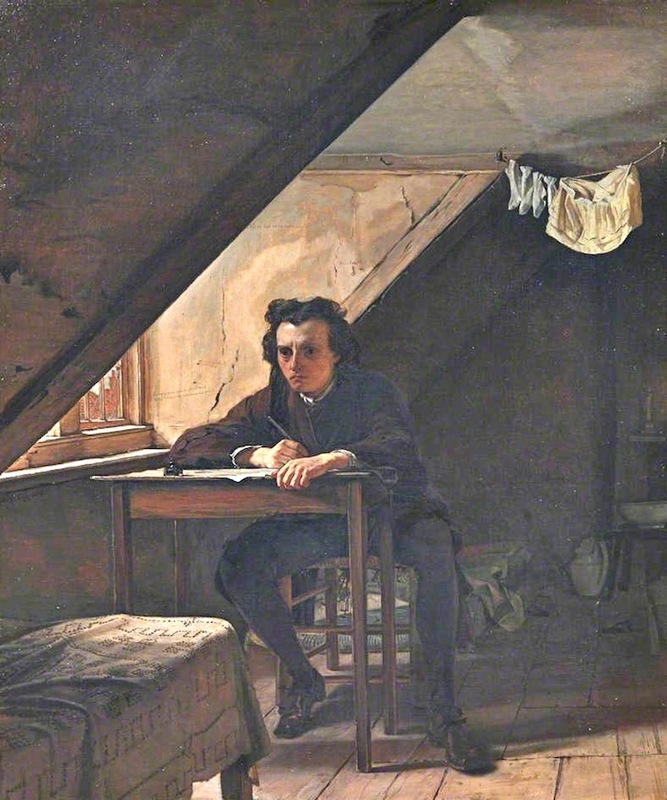 Portrait of the Artist in his Studio, Edward Matthew Ward, 1874. Hospitalfield. It’s so straightforward that you wonder why it took him twenty-two years to complete the commission. But I think I know the answer to that. In 1843, (the year that Patrick married Elizabeth; the year that Richard Dadd killed his father) Ward met an 11-year-old girl called Henrietta Ward. She was no relation at the time, the similarity of surname is coincidental, but he married her five years later when she was 16, at which time he was 32. The marriage lasted and in due course the couple had children. It seems, in order to paint a self-portrait that really did the business, he had to wait until his children were seven and thirteen. So look at the image again, from one girl to the other, on either side of the bowed head of the clear-eyed painter. Look from seven-year-old Enid, to 13-year-old Beatrice, bearing in mind 11-year-old and 15-year-old Henrietta. What a revealing and yet ultimately ambiguous statement in oil paint. Rembrandt eat your heart out: The Ward feller’s masterstroke? 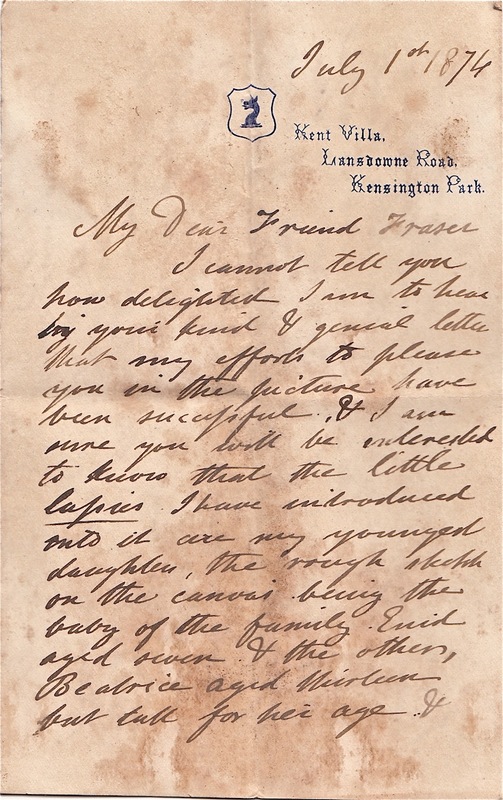 Letter from William Powell Frith to Patrick Allan Fraser, 1875. Courtesy of the Hospitalfield Archive. Why is this an appropriate image to satisfy the commission? Ostensibly, because Frith is in it. But the image may sum up what Frith feels about the transaction between Allan-Fraser and himself. In retrospect, the painter suspects he was buttonholed by his collector friend, and that he’d felt he had no choice but to ‘pay up’ for a commission that he hadn’t asked for. 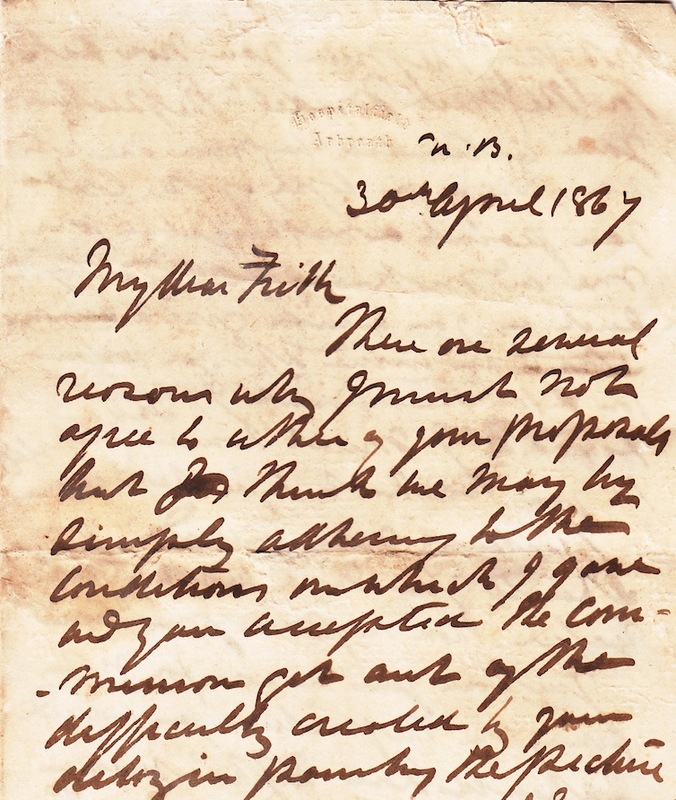 I suppose I mean that the original letter from Patrick amounted to the placing of the flower in Frith’s lapel. But there was also the grouse that would arrive in August of certain years. 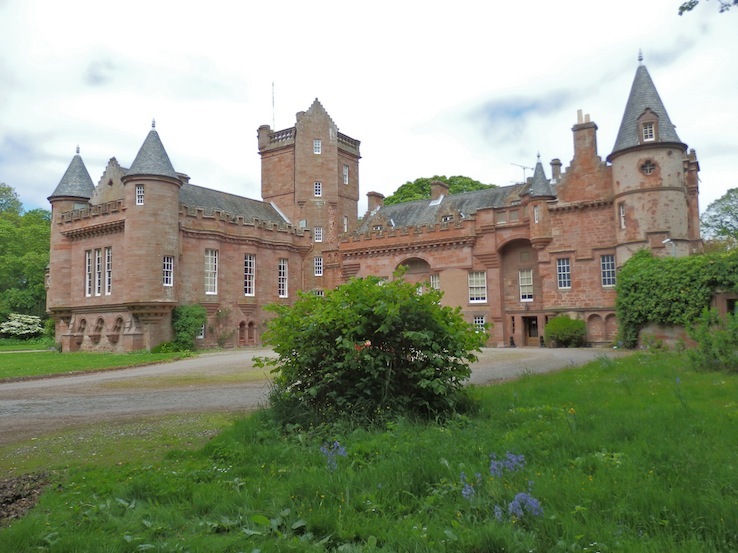 There are several letters from members of the Clique, all dated in August shortly after the glorious 12th (opening of the grouse shooting season), when Patrick and Elizabeth would go for the autumn to Blackcraig, their house in Perthshire, where the shooting was plentiful. 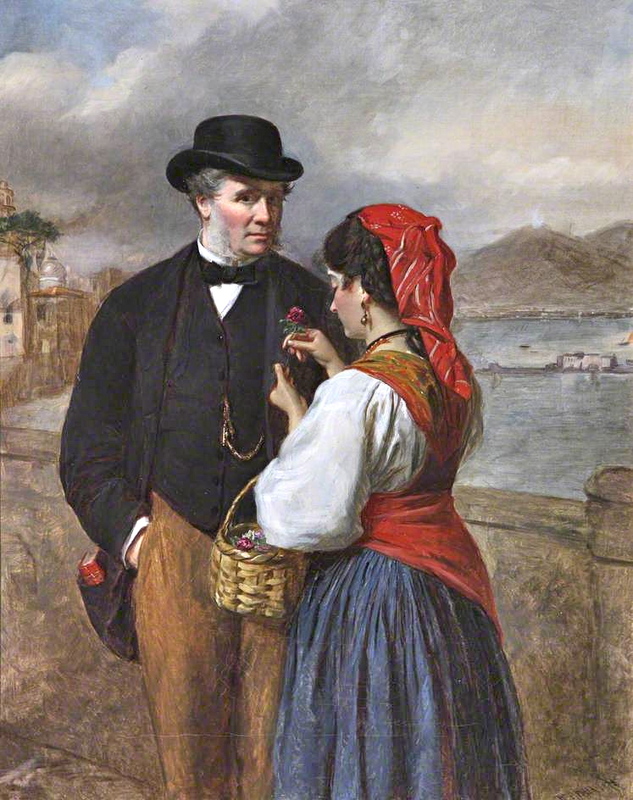 The buttonhole motif might explain why Frith seems to have been upset by Patrick paying him for the picture before he actually received it. 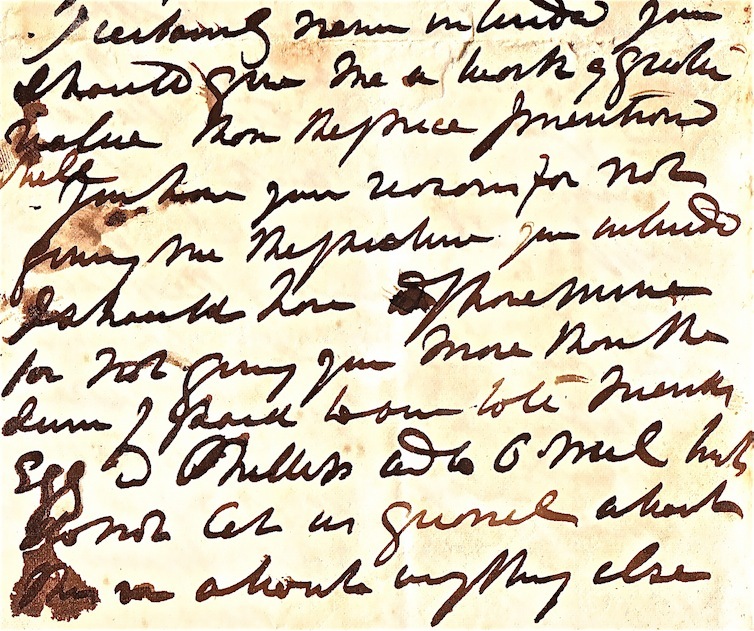 On August 22 Frith wrote: ‘My Dear Fraser, Many thanks for the money which came safe to hand – but why did you [illegible] to tell you got the picture? You may not like it in which case I shall feel I must return you the money. As soon as you see the picture let me know how you like it and if you think its likeness as good as …do. The picture will come tomorrow by [illegible]. Perhaps Frith was pissed off because Patrick was playing him at his own game. Though, if he was, he was doing so innocently. Patrick also paid several of the others once he knew their picture was done but before actually receiving it. But I prefer the suggestion that comes courtesy of Richard Dadd: The Frith Feller’s Masterstroke. OK, that deals with the paintings commissioned from members of the Clique. But there were other self-portraits commissioned by Patrick Allan-Fraser as well as many paintings that were not self-portraits. Bundles of incoming letters are in the archive here at Hospitalfield waiting to be delved into. Letters waiting to bring life into paintings that otherwise hang so quietly on the walls of the Gallery. 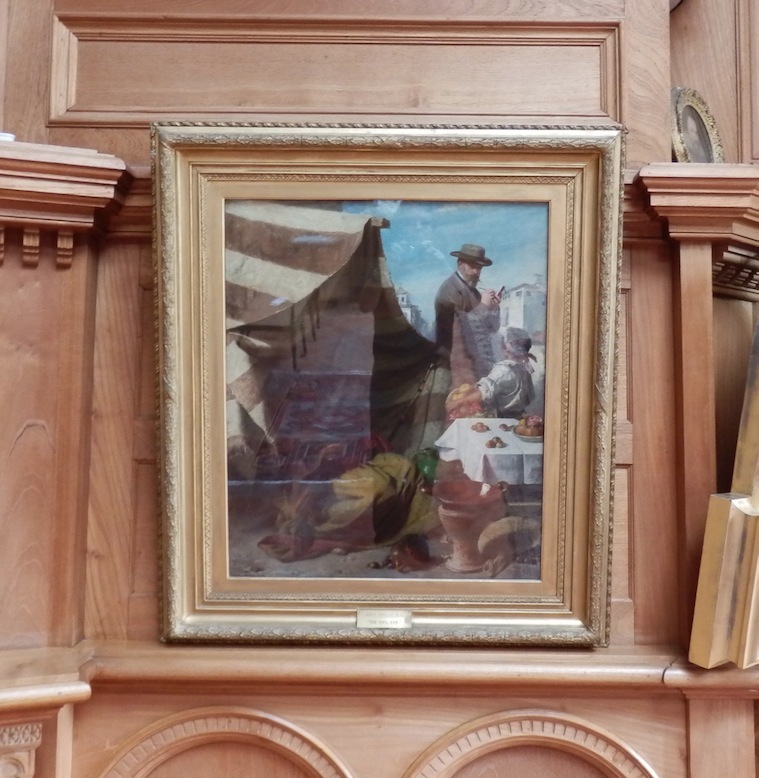 Oh, by the way, at Patrick’s death, the triptych by Patrick Allan-Fraser was valued at £30, the pictures by Frith, Brooks, O’Neill, Ward and Egg were valued at £50. While only the Phillip retained the £100 value that Patrick had paid for it. But time has moved on. As far as I’m concerned they’re all priceless. 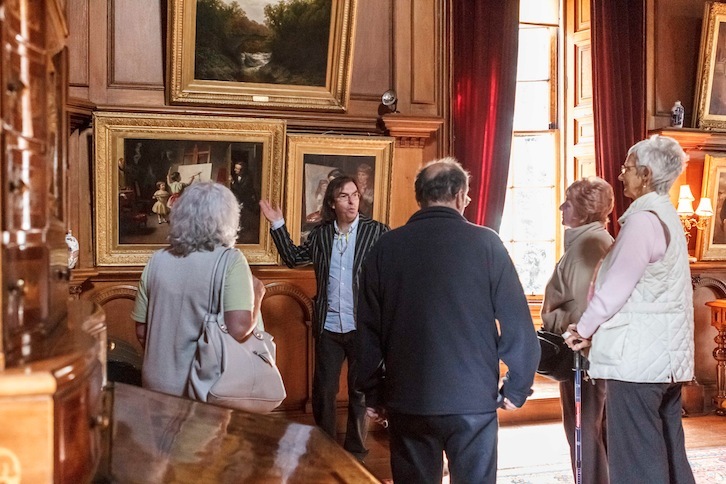 By which I mean that they’re part of the invaluable fabric of this place, which is something I tried to get across when asked to do ten-minute add-ons to the heritage tours of the house that took place over the June open weekend at Hospitalfield. I see the above as a self-portrait. 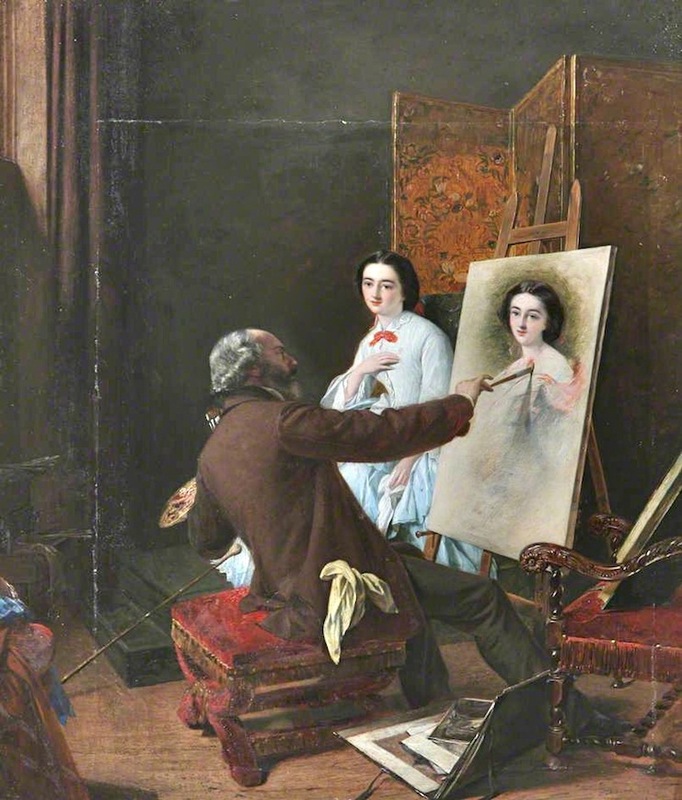 It strikes me that it’s almost as vain and self-important as one of Frith’s self-portraits made in the studio with models. Accordingly, I am waiting for Patrick Allan-Fraser to cough up an inflation-adjusted fee for it. The moment the £10,000 arrives I’ll uncross my arms and the party can really begin. But what am I actually saying in the above ‘self-portrait’? If I remember back to the instant the photograph was taken, I believe I was pointing out that apart from the self-portrait by Augustus Egg, all the others illustrate a relationship between the genders that seems foreign to a contemporary sensibility. Only in Patrick Allan-Fraser’s own self-portrait, which includes his wife and mother-in-law as equals, do I sense a rapport between man and woman that I can feel comfortable with. I think this is the place to say that Elizabeth, who died in 1873, wasn’t around when the self-portraits of Ward and Frith arrived. And I’m certain that this took the edge off Patrick’s pleasure on seeing his vision through to the end. Sidestepping this sadness for now, what a bold piece of commissioning the self-portrait series was! Patrick persisted with it over the decades until he had portraits of all the painters that he’d known well in his London days. I can’t help thinking that the self-portraits, combined with the fine paintings by those same members of the Clique that are owned by the Trustees of the Tate would make a great show for the art lovers of London. In one way, the Tate’s Richard Dadd painting would be the centrepiece of any such show. But is not the long story of the WP Frith self-portrait not just as interesting? Or the story behind the EM Ward picture? However, it’s John Phillip that I’d like to follow up next. The man who married the sister of one founding member of the Clique and died in the studio of another. Hopefully I’ll get an opportunity to look at all 23 of the letters that he wrote PAF from Aberdeen and London. And I’ll see where they lead me. Spain? This page was first drafted during my residency at Hospitalfield in June, 2013. But following the hours I spent in the Gallery giving my self-portrait talk again as part of ‘Exchange’, the show presented over the open weekend of September 14-15, 2013, I’ve revised the material, going into things more deeply. Is there more to say? Of course there is, and I dare say this page will be transformed in the future.